As Tennessee Williams said: "Luck is believing you are lucky" - and it has been proved that there is power in a thought made concrete by a charm - being a constant reminder of purpose and desire. In other words, it is the thought, the belief, that counts. So whatever your favourite teacher's beliefs, this token will help remind them of their goals and give them strength. It will tell them how much they are valued, and inspire them in their job. 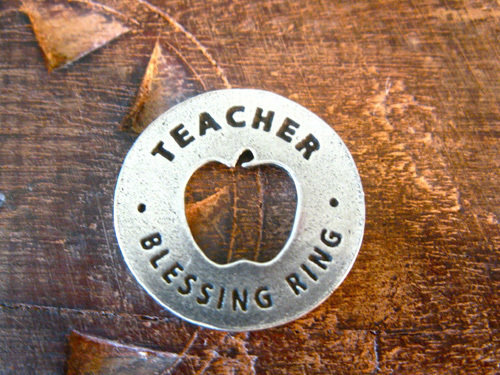 Detail: The front of the blessing ring says "TEACHER BLESSING RING, and on the reverse "TO TEACH IS TO TOUCH A LIFE FOREVER". It is made from lead-free, cadmium-free pewter that is certified safe. . . a wonderful present to give a much-valued teacher, or a friend who teaches. Comes gift-wrapped, like all our presents - and we can print a personal message on your behalf.